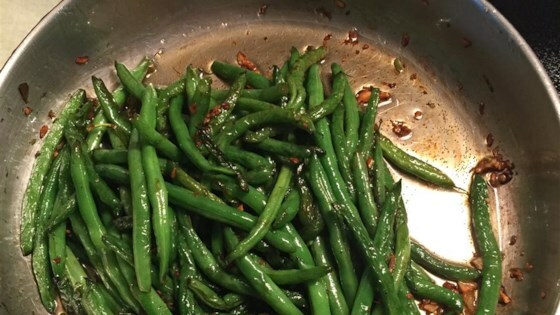 "A great way to make string beans..like the way they do in Chinese restaurants...only better! Also good with asparagus or broccoli. " Heat the peanut oil in a wok or skillet with high sides over medium-high heat until almost smoking; add the green beans. Quickly cook and stir the beans in the hot oil until they are bright green and starting to show brown spots, about 2 minutes. Remove the beans to a bowl. Drain all but 2 tablespoons of oil from the pan and return to heat. Cook and stir the ginger and garlic in the oil until they have started to brown, about 2 minutes. Return the green beans to the wok; add the dark soy sauce, sugar, and black pepper. Cook until hot; about 30 more seconds. Perfect! I didn't have a whole lb of beans so I kinda tweaked the other ingredients as best I could, and they turned out amazing! I added a pinch of chili flakes for additional zip. These are tasty! I used frozen beans and light soy sauce, otherwise, kept the recipe the same. The green bean flavour comes out, as well as the spices. Yum! These green beans were so good. I have three children who are very picky eaters and they all ate these. Wonderful and full of flavor! This was a quick and easy side dish. My boyfriend said he's never tasted anything so good that was green. Great side for my asian themed dinner!